The 2019 FAUW Board elections are now complete. Dina Dawoud (Statistics & Actuarial Science) and Patrick Lam (Electrical and Computer Engineering) will join the Board this July as at-large directors, along with Narveen Jandu (School of Public Health and Health Systems) in the Applied Health Sciences seat. 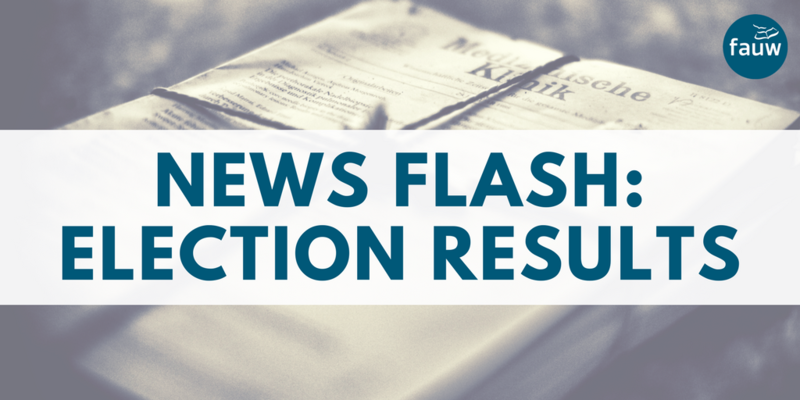 Shannon Dea (Philosophy) and Johanna Wandel (Geography and Environmental Management) were re-elected as at-large directors, and Brent Matheson (Math/Business and Accounting) will continue on in the lecturers position. The Faculty Association’s Equity Committee is looking for new members. The committee is strong and active. New members bring forward fresh ideas and enthusiasm that help maintain the momentum of the committee. The Faculty Association is reopening nominations for the Applied Health Sciences seat on our Board of Directors, for a one-year term starting July 1, 2019. 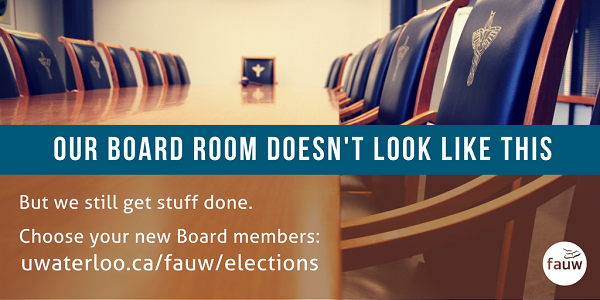 The 2019 FAUW Board of Directors elections are happening next week. All voting members are eligible to vote for four at-large directors from among seven candidates. The key recommendation of the working group was to increase the lecturer and clinical lecturer T1 and T2 thresholds. 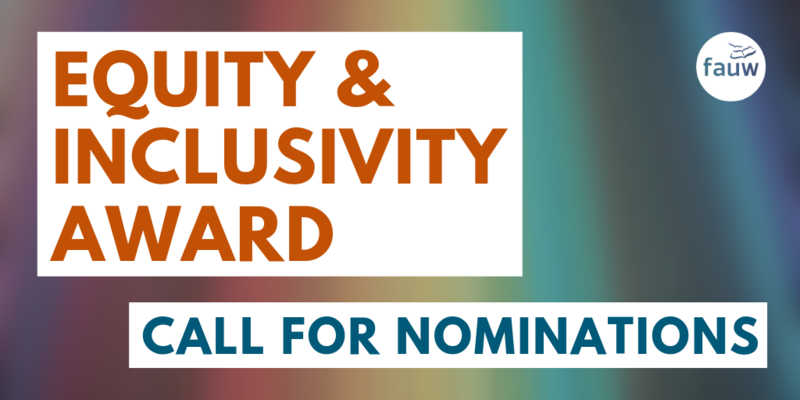 The FAUW Equity Committee is seeking nominations for its annual Equity and Inclusivity Award. 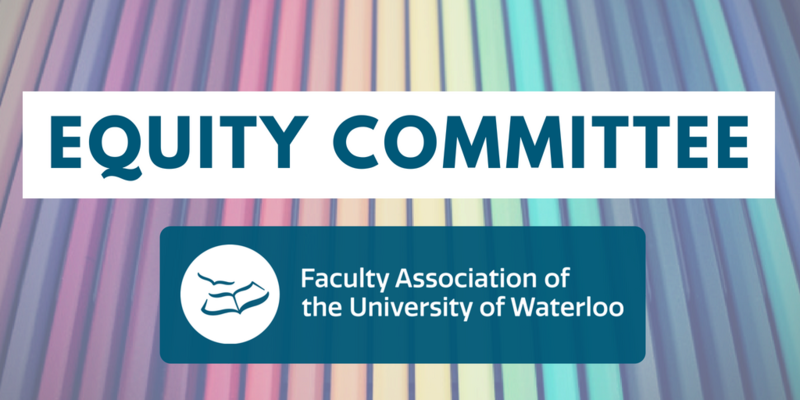 The award celebrates members and/or affiliates of the University of Waterloo community whose actions have made a demonstrable impact on equity, inclusivity, and/or diversity at the University. The University of Waterloo dental plan currently reimburses 80% of the cost of basic expenses as set out in the Ontario Dental Association (ODA) fee guide from two years ago (up to an annual maximum). Effective for treatments starting January 1, 2019, this reimbursement is increasing to 95% of the ODA’s current fee guide. The move from the two-years-old fee guide to the current fee guide also affects major dental work and orthodontic work. Reimbursement for these costs should increase by 4-8%. The FAUW elections committee solicited nominations for FAUW president from October 11 to November 9. The committee received only one nomination during this period, so FAUW is pleased to announce that Bryan Tolson is acclaimed for a second two-year term as FAUW president starting July 1, 2019. Congratulations Bryan! 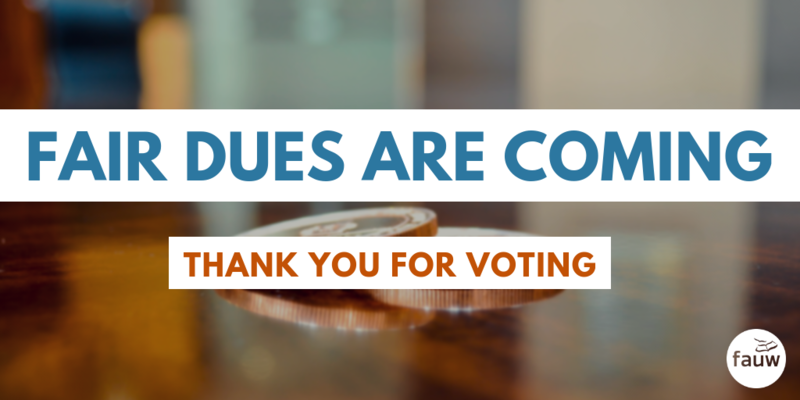 Last week, Faculty Association members voted to change how we calculate dues. 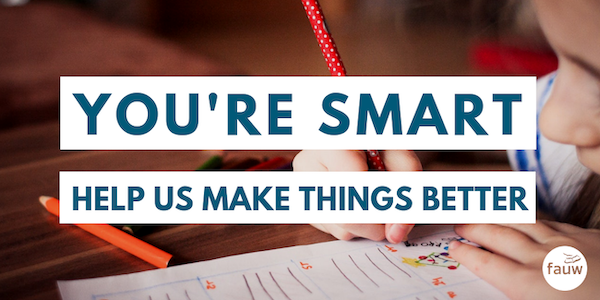 Currently, each faculty member represented by FAUW pays 0.525% of the average base salary for faculty members at their rank. Starting in the new year, each faculty member will pay 0.525% of their own base salary, which makes for a more equitable distribution of dues and brings FAUW in line with other faculty associations. We expect Human Resources to implement this change in January 2019.